The Sarapiquí Conservation Learning Center has a long history of working with various youth programs here in Sarapiquí and whether through scholarships, Aves Club, camps or After School Programs, we are always finding new ways to reinvigorate our community commitment. Our strongest connection has always been with the Chilamate students who literally live at our front door and are lucky enough to always have access to the center. However the Chilamate School is just one of the five neighboring schools within a 6 kilometer radius of the Center. For the past 8 months our ASP coordinator, Joanna Colon has been strengthening these outer bonds and growing our ASP program in directions we previously did not go before. After working at our two-week camp last January Joanna connected with not only our Chilamate neighbors, but also with the nearby Linda Vista and Cristo Rey schools. Joanna’s connection has not only welcomed more children into the center, but she introduced the SCLC After School Program into Cristo Rey and Linda Vista Schools via what she term’s “ASP on-wheels”. One of the positive features of Joanna’s added activities is that students who did not regularly frequent the center in previous months have started attending, creating ties, being introduced to new opportunities and projects that were previously not at their disposal. One of her greatest accomplishments has been connecting with the Aula Abierta students of Cristo ReynSchool. Aula Abierta is a provisional program offered through Cristo Rey specifically for elementary students who haven’t been able to continue course work on a normal academic schedule. Many are parents, have jobs and are older than the average student body. The program title “Aula Abierta” literally translates to “Open Doors” and the students have the ability to come and go as they are able, putting graduating onto high school or a more professional environment into their hands. These self motivated students have come into the SCLC folds and have not only made into our hearts, but they have also become part of regularly scheduled programming. Students participate in the SCLC’s activities twice a week, through both classroom work and activities. In addition to learning about river ecology in the classroom, they have earned some exciting off-site activities. Supported by Adventuras del Sarapiquí the students were escorted on a Saturday rafting trip on the Sarapiquí River after the summer holiday break. They were offered the opportunity to do trash clean-up and to get a firsthand look at where all the garbage comes from…water front with houses!! They collected six bags of garbage, a tire and a vacuum! Selva Verde Lodge also supported the student group after their unit on forest ecology. 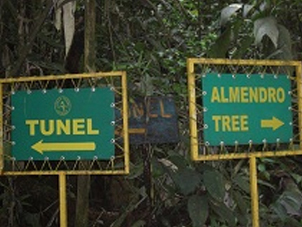 Students were able to examine the habitats they had been studying firsthand with a guided hike into the Primary Forest. 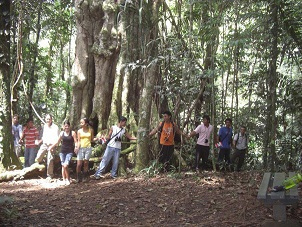 Although all of the students have grown up in Sarapiquí only a few had previously explored old growth jungle. Thank you Adventuras and Selva Verde for your continued support!